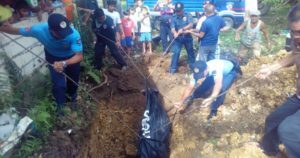 Abu Sayyaf militant Abu Saad is buried right outside the Tiptip Public Cemetery on May 5, 2017. The body of slain Abu Sayyaf bandit Saad Samad Kiram, alias Abu Saad, was buried at past 3 p.m. yesterday afternoon at the periphery of the Tiptip Public Cemetery in Barangay Tiptip, Tagbilaran City. He was buried right beside the cemetery in a private lot owned by the graveyard’s caretaker, Eddie Alturas, 67. Alturas said that he offered the lot to extend support to the government and to avoid inconveniences of having to bring into the cemetery a backhoe which would have been needed to dig a new hole. The use of a backhoe would have also required the dismantling of the cemetery’s gate for the equipment’s passage. He also told media that he wanted to help in settling the problem of where the bandit will be laid to rest. Alturas coordinated with Barangay Captain Antonio Restauro and City Hall led by Mayor Baba Yap as he donated the lot. Kiram was reportedly shot dead by policemen after the suspect bolted from his escorts while he was being transported from Camp Dagohoy to the Bohol District Jail.